From an early age, as a preacher’s kid (or P.K. as everyone referred to us) I was led to believe that you can’t get into Heaven without a covered dish. Maybe it’s because I grew up in the Midwest where a potluck supper was a primary social occasion, but usually a casserole doesn’t appeal to me. It always felt like an unappetizing way to get rid of leftovers. Since I’ve become an adult, I have discovered that a casserole doesn’t have to be the lifeless, tasteless dish I remembered from childhood. I adapted this recipe from the March 2011 issue of Cooking Light, and made it into one of those “quick and easy” ones that might be worth fixing from time to time. Coat either an 8-inch square glass baking dish or a glass loaf pan with cooking spray. Heat oven to 425 degrees F.
I used 5 of the largest chicken tenders (breast meat) out of a large Costco package. I zapped them in a microwave until softly cooked. In other words, they weren’t raw but they weren’t overcooked, either. I shredded these into a bowl and added about 1 ½ tablespoons of chopped cilantro, 3 ounces cream cheese (fat-free works here), ½ teaspoon each of ground red pepper and ground cumin, plus salt and pepper to taste. In a saucepan, sauté half a large onion and lots of garlic (I used 6 cloves). Add a cup of chicken broth, and about a cup of your favorite salsa verde and a little water. I used my own chipotle salsa; see my recipe here. I stirred in the chicken, cream cheese and seasonings combo with the liquid mix in the saucepan. In a large skillet, I heated 10 6-inch corn tortillas, about a minute on each side, then cut them into quarters. 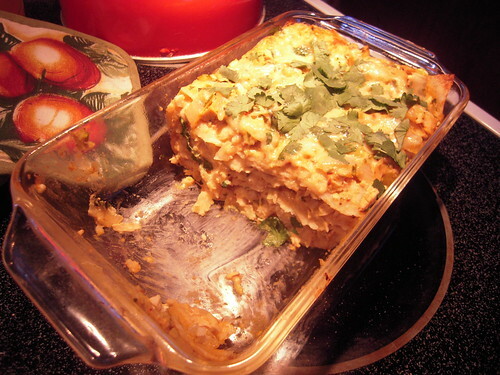 Starting with a layer of the chicken mixture, alternate layers of the tortilla quarters, ending with the chicken mix. Sprinkle shredded cheddar cheese, or Mexican Cheese mix over the top and bake for 15 minutes until lightly browned and the cheese is bubbly. Before serving, I topped it with more fresh chopped cilantro and served with sour cream on the side. Fat free sour cream can be used here, if you are watching your fat intake. I might add more salsa next time, as it seemed a bit dry to me. Also, I like things fairly spicy, so I suggest you use your own taste buds to determine how much to add. I served this with corn on the cob and salad. It made two meals for two people, but we ate large servings. Again, let your own needs determine how many it will serve. I think this could easily be doubled if you plan to take it to one of your own potluck occasions! 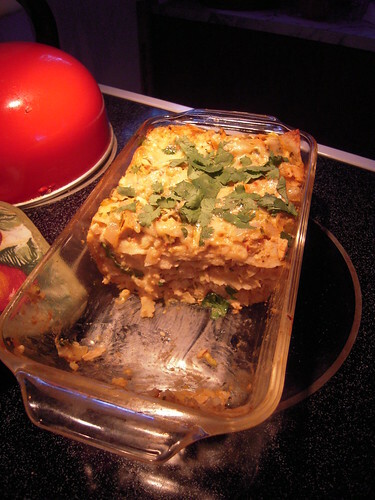 This is one of those recipes that you can play around with, I think, but isn’t that true of most casseroles?